Junior forward Jill Barta will be key to Gonzaga's continued success. 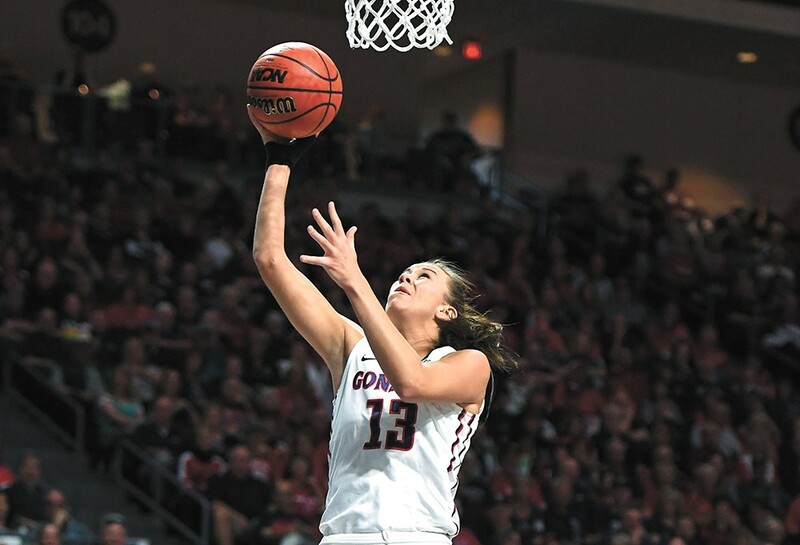 Gonzaga's women's basketball program has become, much like their counterparts on the men's side, a standard-bearer for sustained success in college basketball. Last year's team won 26 games and earned the program's ninth berth in the NCAA Tournament. After missing out the previous year, snapping a streak of seven straight trips to the tournament, last season served as a return to normality. And fourth-year head coach Lisa Fortier has everything she needs to keep things that way. "It was a little bit of a fluke, the year before," Fortier says. "We had to rely very heavily on a lot of freshmen." Those freshmen, notably Laura Stockton and Jill Barta, would gain experience that proved invaluable as sophomores. Barta was named to the all-West Coast Conference first team last season and Stockton was an honorable mention. But it was a pair of all-WCC seniors, Kiara Kudron and Elle Tinkle, who led last year's team. "It seems that we lost 10 players when we lost those two," Fortier says of Kudron and Tinkle. Losing players to graduation comes with the territory in college athletics. Replacing them effectively, with returning players or incoming freshmen, is the challenge. Gonzaga will be doing it with a bit of both. A highly rated freshman class, with three ESPN top-100 recruits, brings an influx of talent. Canadian guard Louise Forsyth looks to be the best of the bunch, which includes the program's first pair of twins: Jenn and LeeAnne Wirth. Fortier praised not only the newcomers' basketball abilities, but also their work ethic. "A lot of times they come in and have to sit back and learn from the upperclassmen, but I think a lot of our returners are learning from them as well," Fortier says. There are six upperclassmen on the roster this year. Stockton and Barta were thrown into the fire as freshmen, but now they're experienced — and talented — juniors. Gonzaga's leading scorer last year was Barta, who averaged 16.8 points per game. And Stockton, appropriately for the daughter of Zags legend John, led the Bulldogs with 4.4 assists per game. The core of the team's attack is back this season, which makes life easier for Fortier, even though her incoming freshmen are highly touted. "I don't love having to rely on young players early to make huge impacts," Fortier says. "It's nice to not have to add a bunch of people who have not had a significant role into the lineup. We're able to get going and get after it from an earlier time of the year." Another brutal early-season schedule means getting off on the right foot, right away, will be critical. The Zags open the season with five straight games away from home. Gonzaga heads to Colorado State on Nov. 13 before playing at Montana five days later. After that, it's down to Las Vegas for Thanksgiving and the Play4Kay Showcase. Potential opponents include a pair of preseason top-10 teams in Ohio State and Stanford. Gonzaga's home opener isn't until Nov. 30; it's a winnable game, but one against regional rival Eastern Washington. The Zags also play Washington State in Pullman on Dec. 6.